The Cosmic Liquidator by Sun Products Corporation (a Talley Industries company, now known as Talley Defense Systems) is the oldest known air-pressure-based water blaster. However, presently little is known about the manufacturer. 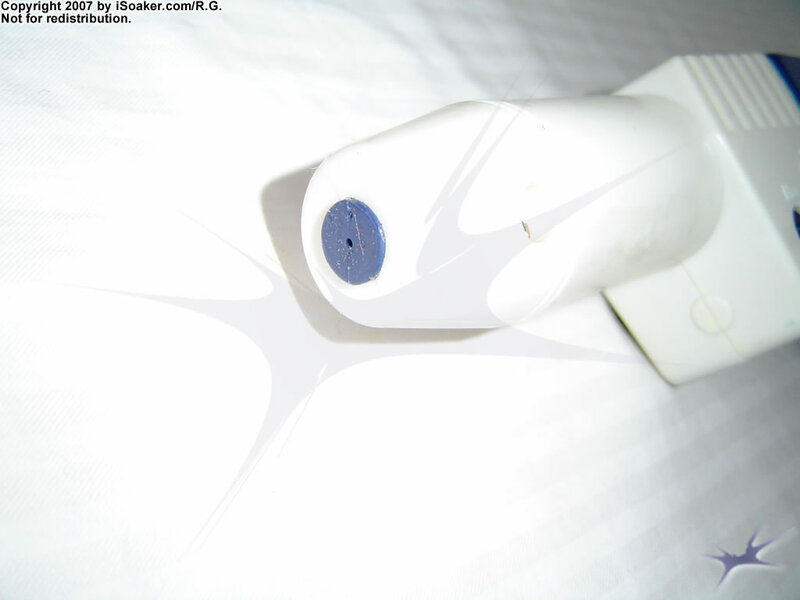 The Cosmic Liquidator in the iSoaker.com Holdings appears to suffer from age and lack of use; some of its inner tubings were initially sealed shut, though could be repaired to a limited extent. It also features a pulse-setting, but this feature does not appear to work properly on the available model. For target practice, the Cosmic Liquidator also comes with a set of targets or semi-thick cardboard backing. However, exactly what an "Alien Starball" is supposed to be remains presently lost to time. 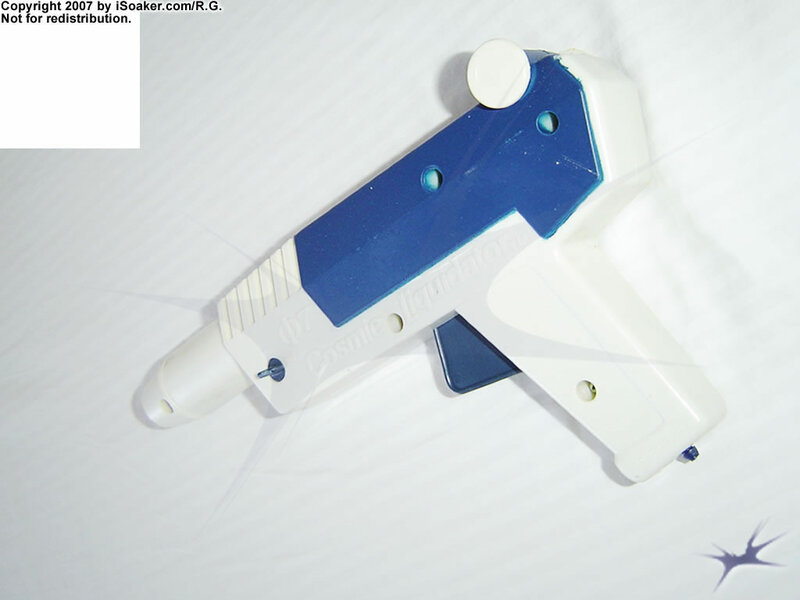 The nozzle on the Cosmic Liquidator is smaller than those even found on the Classic Super Soakers. However, considering the year this water blaster was released, its diameter is average, but the stream the Cosmic Liquidator is capable of producing outclassed any squirt pistol of its day. Interestingly, the nozzle also has two settings: Pulse and Max. The effect the different settings had on stream performance is not fully known since the model tested showed signs of its age and parts of the inner tubing had collapsed. When this blaster was new, the more pliable nature of the tubing would likely have shown some performance difference between the Pulse and Max settings. While stream performance is great for its day, the Cosmic Liquidator does partly suffer from reduced maximum flow due to the length of tubing between the reservoir and the nozzle. Shorter tubing would likely improve performance by reducing resistance, but then mobility would be compromised. The pump on the Cosmic Liquidator is minimalistic, yet functional. Mounted on the reservoir-pack, this pump has a metal pump rod and feels quite sturdy despite its thinness. The amount of air moved with each successive pump is not known, though the pump volume does not appear to be very large. According to the instructions, a user should pressurize the chamber by pumping on the order of 60 times. Whether the pump performed better when it was still new is unknown. The trigger and grip area is minimalistic in design, but adequate and comfortable to hold. While not as nice as some of the newer, sculpted grips, the Cosmic Liquidator's clean lines and open base means that hands of almost any size can hold the blaster portion comfortably. The trigger, itself, has a single spring giving resistance and pulls very smoothly. However, due to the age of this blaster, there is a notable lag between trigger pull and stream production likely due to the inner tubing taking an additional moment to decompress to allow water to flow. When this blaster was new, response time would likely have been much better. The Cosmic Liquidator features a decent-sized reservoir that clips to one's belt and attaches to the blaster portion via a ~1m (3') long clear piece of tubing. Tubing attaches to both the reservoir and the blaster using a small, tapered, quick-disconnect connection. This method of tubing connection was likely chosen as a safety precaution; if the pressure in the reservoir gets too high, the tubing from either the blaster end or reservoir end will disconnect, releasing the excess pressure (and likely making a mess), but prevent a more problematic housing failure. 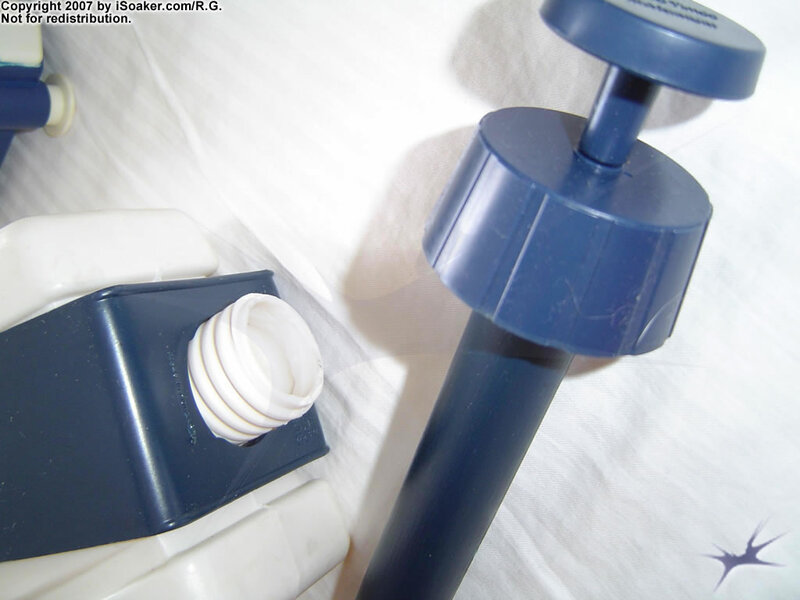 The reservoir cap contains the full pump assembly and inserts quickly and easily into the body of the reservoir. Instructions suggest that the reservoir only be 50% filled in order for maximum performance. Testing was done at the recommended 50% fill level, though filling the reservoir to 66% - 75% should still offer good stream performance while giving one additional ammunition in the water warfare field. The Cosmic Liquidator is presently the earliest released stock pressurized reservoir water blaster, pre-dating the Super Soaker SS 50 by at least 10 years. While some statistics were measured, output and shot time statistics are likely not accurate had this been a new product. Considering its age, the Cosmic Liquidator undoubtedly outperformed the majority of other available squirt pistols of its time. As such, the Cosmic Liquidator is given a special place in the iSoaker.com Water Blaster Hall of Fame. Its value on the water warfare field today, however, is purely for collection purposes as the majority of modern water blasters are much more durable and perform better than this classic water blaster. Small, light, easy to carry. Apparently the first air-pressure-based water blaster; as such could produce a solid water stream for upwards of 30 second while other squirt guns could only produce small squirts. Fragile; has tendency to leak. Connections will pop if the reservoir is over-pressurized.